I am looking for at least one back up and any other “friends or family members” to match this plush doll. I cannot locate any sources to purchase this toy. This doll is carried by my three year old little girl, Naomi, everywhere. ( She calls her doll Alice ) First of all I would love a back up just in case…. This one has been washed gently about 10-15 times. It is starting to fade and worn looking. Also, she keeps asking for ” Alice’s Mommy and Daddy”. I would love to find any other similar dolls for her. The original was a present from a family member who does not remember where she got it. It was attached to a “Happy Birthday” gift bag, with no packaging. The face looks like DanDee brand Tickle Wiggle’s face, but this isn’t a Tickle Wiggle. It is not battery powered. 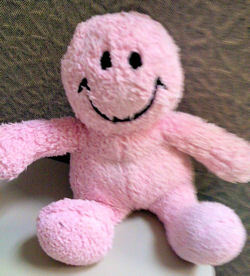 If you can help Jamie find this Pink Chenille Smiley Face Doll, THIS SITE IS NO LONGER ACTIVELY MANAGED. Please use Our FREE FACEBOOK GROUP, including #100908-5 in the subject, . Item number: 360034842212 ebay. Looks like it. I’m glad we were able to help you Jaime. I normally leave then online and change them to FOUND. It gives other families hope.